Team members use forms to sign up friends and family. Two week sales period. Delivery in the third week. Payments are collected by your team members up front. At the end of the period, orders are combined into one big order and sent to Crispy Pop with payment. We prepare and deliver your order and team members distribute to your supporters. You pay only 40% of the end price that you charge (assuming certain thresholds are met). 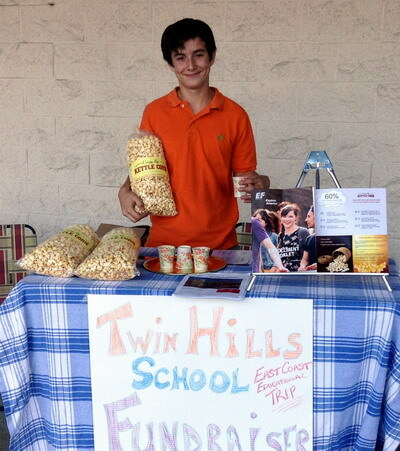 After obtaining advanced permission, one or two team members set up outside grocery stores, local events and other high-traffic areas with a table, hand made sign, change box, brochures and samples. The sign describes the nature of your fundraiser, and should be hand drawn and colorful. Crispy Pop will provide the brochures and kettle corn. Depending on the size of the order, payment for the kettle corn is made within a week of delivery. Depending on the location, you can expect sales of between 30 and 50 bags per location per day. We recommend between 5 and 10 locations in a one-week blitz. Requires a minimum order of 300 bags.